45 w w w . M o d e r n T i r e D e a l e r . c o m Commercial Vehicle Tires | www.continental-truck.com Digital Tire Monitoring Reduces Costs and Increases Uptime Digital Tire Monitoring Continental off ers two distinct solutions to help you reduce tire-related breakdowns, eliminate manual tire pressure checks, improve fuel eff iciency, and extend the life of tires and casings. 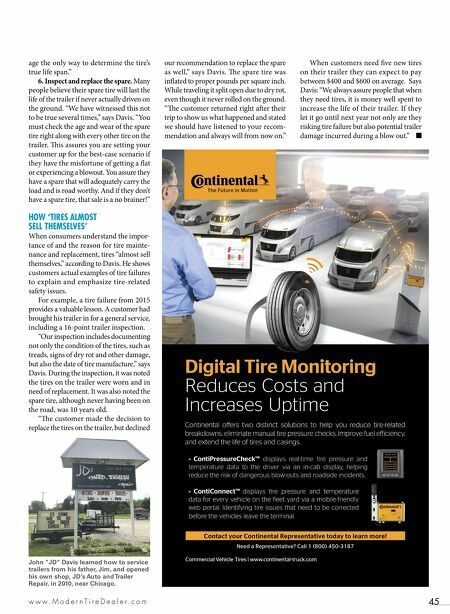 • ContiPressureCheck™ displays real-time tire pressure and temperature data to the driver via an in-cab display, helping reduce the risk of dangerous blow-outs and roadside incidents. • ContiConnect™ displays tire pressure and temperature data for every vehicle on the fleet yard via a mobile-friendly web portal. Identifying tire issues that need to be corrected before the vehicles leave the terminal. Contact your Continental Representative today to learn more! Need a Representative? Call 1 (800) 450-3187 When customers need five new tires on their trailer they can expect to pay between $400 and $600 on average. 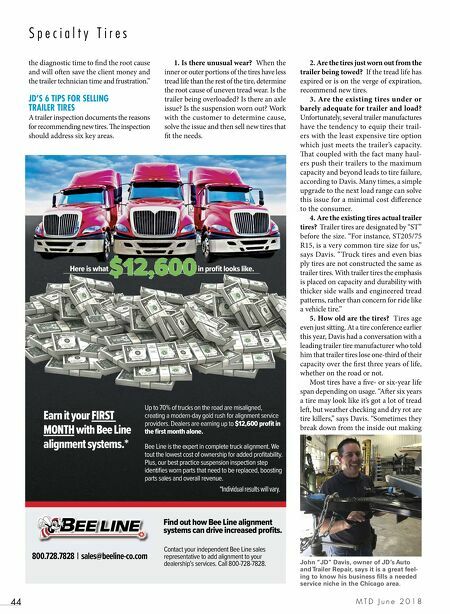 Says Davis: "We always assure people that when they need tires, it is money well spent to increase the life of their trailer. If they let it go until next year not only are they risking tire failure but also potential trailer damage incurred during a blow out." ■ our recommendation to replace the spare as well," says Davis. e spare tire was inflated to proper pounds per square inch. While traveling it split open due to dry rot, even though it never rolled on the ground. "e customer returned right aer their trip to show us what happened and stated we should have listened to your recom- mendation and always will from now on." age the only way to determine the tire's true life span." 6. Inspect and replace the spare. Many people believe their spare tire will last the life of the trailer if never actually driven on the ground. "We have witnessed this not to be true several times," says Davis. "You must check the age and wear of the spare tire right along with every other tire on the trailer. is assures you are setting your customer up for the best-case scenario if they have the misfortune of getting a flat or experiencing a blowout. You assure they have a spare that will adequately carry the load and is road worthy. And if they don't have a spare tire, that sale is a no brainer!" HOW 'TIRES ALMOST SELL THEMSELVES' When consumers understand the impor- tance of and the reason for tire mainte- nance and replacement, tires "almost sell themselves," according to Davis. He shows customers actual examples of tire failures to explain and emphasize tire-related safety issues. For example, a tire failure from 2015 provides a valuable lesson. A customer had brought his trailer in for a general service, including a 16-point trailer inspection. "Our inspection includes documenting not only the condition of the tires, such as treads, signs of dry rot and other damage, but also the date of tire manufacture," says Davis. During the inspection, it was noted the tires on the trailer were worn and in need of replacement. It was also noted the spare tire, although never having been on the road, was 10 years old. "e customer made the decision to replace the tires on the trailer, but declined John "JD" Davis learned how to service trailers from his father, Jim, and opened his own shop, JD's Auto and Trailer Repair, in 2010, near Chicago.